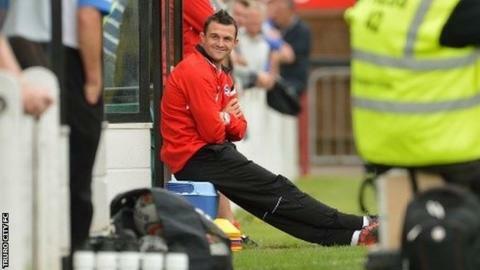 Truro City manager Steve Tully says he is happy with the way his side is developing so far this season. The White Tigers have taken seven points from their last nine in the Southern Premier League as they prepare to take on pre-season favourites St Neots Town on Saturday. "We're heading in the right direction," Tully told BBC Radio Cornwall. "We're going away to these teams and competing which is a good sign for the future," the City boss added. Truro face a difficult spell over the next seven days hosting St Neots before going to nearest rivals Bideford on Bank Holiday Monday and travelling to Corby Town the following Saturday. "When we looked at the first 10 games of the season we always knew it was going to be a tough start. "I think we play seven out of the top 10 last season and three or four of them are away from home so we knew it was going to be tough, it was all about getting points on the board as early as possible. "What I like about the team is that we've got that resilience about us, even if we concede a goal, even if we go 1-0 up, we're always in it and we've got that physicality about ourselves."